In soccer, the quality of a game is greatly dependent on its smooth flow and observance of the general rules of sportsmanship. Committing a foul on an opponent results in the referee momentarily stopping the game and punishing the offender. Each foul committed during a soccer match attracts a specific punishment to the fouler. The referee may also award the fouled team a free kick or a spot kick. But what if stopping the game would benefit the team that committed the foul more than a free kick would benefit the fouled team? This is when the advantage rule in soccer applies.The referee motions the players to play on allowing the offended team to take advantage of the continued play. What’s the Advantage Rule in Soccer? The advantage rule in soccer guides referees on how to handle fouls when the offended team has a better chance of scoring with‘play-on’ than it has if awarded a free kick. The rule applies when an attacking player is fouled by a defending team but his team is still in control of the ball. Despite the need to caution the offender, the referee should not stop the play. Instead, he should allow the attacking team to seize the goal-scoring advantage. In applying the advantage rule, the referee must first ascertain that the offended team has not only a ball advantage but also has a game advantage. While the rule may seem subjective, there are several standard considerations stipulated to guide its application. Firstly, the referee must consider the nature of the foul committed. Where a player suffers a severe injury, the referee must stop play and respond to the foul. Secondly, the referee must consider the location of the foul on the pitch. The rule should apply if the offended team is in control of the ball inside the offender’s midfield. Thirdly, ‘play-on’ is recommended if there is a realistic probability of a successful attack by the fouled team. Lastly, it is critical to factor in the general mood in the pitch such as a need to save time in the last minutes of the game. In the video, the referee identifies that the offended team has a real opportunity to score a goal if allowed to play on. How Long Is the Advantage Rule in Soccer? The advantage rule ensures that the fouled team does not suffer a disadvantage from the decision of the referee to stop play after a foul is committed. The referee must decide to either allow the game to continue or to stop play within the shortest time possible. 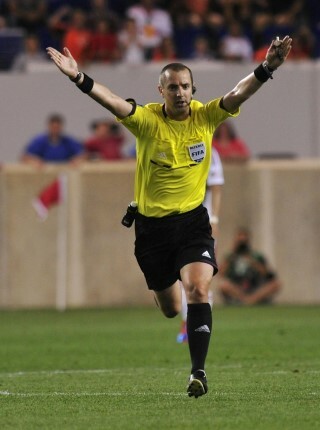 A soccer referee is at liberty to employ the ‘wait-and-see’ tactic before applying the advantage rule. However, once he allows ‘play-on’, he cannot recall the decision after the advantage has been executed and lost. Such a delay will normally not exceed five seconds. The ‘wait-and-see’ tactic enables the referee to delay blowing a whistle after a foul is committed. The tactic helps him ascertain whether the offended team can derive more benefits from a ‘play-on’ than it would from a free kick. What If a Referee Stops Play When Advantage Could Have Been Played? Sometimes, a referee may overrule the benefit of ‘play-on’ for an offended team. On witnessing a foul being committed, the referee should stop the game, caution the fouler, and award the offended team a free kick. A referee may also overrule the benefit of ‘play-on’ if the fouled player had suffered serious injuries from the foul. In such cases, the referee will award the offended team a free kick and punish the fouler accordingly. Can a Player Be Booked or Sent Off for Committing a Foul That Leads to an Advantage Being Played? Even when the referee chooses to let the offended team play an advantage, he must punish the fouler at the next stoppage. The referee will punish the player based on the severity of the foul committed. This implies that a player may get booked or sent off even if the advantage was played. If the foul committed warrants a direct red card, the referee may opt to stop play immediately and send the fouler off the pitch. However, ‘play-on’ may be allowed if the offended team has control of the ball in the offender’s penalty area.